The owners of Square Thrills can get this ebook for half price. This is not about construction of a magic square. This is about presenting and representing a magic square in such a manner that the audience cannot uncover your secrets by doing a simple search on the internet, which is what is happening to most of the magic square routines these days. 5 solutions for alternative presentations/representations for a magic square are provided along with some bonus ideas. A novel and self working routine is included which uses the magic square principles in a clever and unconventional manner but does not actually use a magic square. This refreshing routine is extremely easy to perform. No math or memory are involved for the performer. This is a novel technique of using the fundamental magic square principles without actually constructing a magic square but using it as a prediction or a force. 3 alternative handlings and 2 optional handlings are also included along with the necessary blank templates for you to print and use. This is a 'must have' knowledge for everyone who is into the performance of magic square based routines. Audiences are more sophisticated these days, and what was once astonishing in the gas-light era is just ho-hum in the Internet age. It's nice to read this thoughtful ebook. We need more writing like this to help us tweak classic performance tools for the 21st Century. I'm sure Martin Gardner would have been proud. Do not be square learn to present the square with the authors creative look on this much under used item. As in the advertising words states ''This is not about construction of a magic square. This is about presenting and representing a magic square in such a manner that the audience cannot uncover your secrets by doing a simple search on the internet, which is what is happening to most of the magic square routines these days.'' Not just magic square routines but other magic effects presented to spectators should be given the same train of thought. Back to this work on squares it is vary easy reading and well thought out as is all the authors works in my increasingly growing collection of his mathematics based creative ideas. As a lover of the late Martin Gardner's works I find his ideas Must have some how influenced the unknown mentalist ? or some over mathematicians work. 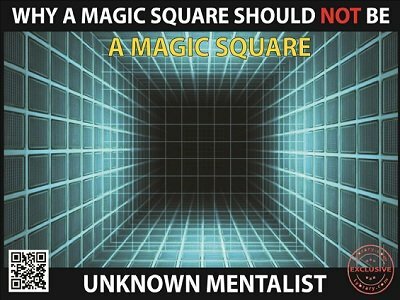 I would also recommend visiting markfarrar.co.uk and to study his Magic Square resource page it will stimulate like this work by the Unknown Mentalist's your brain too.